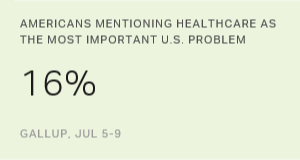 16% of Americans name healthcare as top problem in U.S.
27% are satisfied with the direction of the U.S.
WASHINGTON, D.C. -- As the Senate continues to work toward a new healthcare bill, 16% of Americans name healthcare as the most important problem facing the U.S. 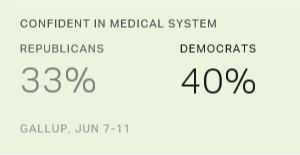 This is up from 7% in June, but similar to the 18% recorded in May, when the House of Representatives passed its version of a bill to repeal the Affordable Care Act (ACA). These findings represent the highest percentages mentioning this issue since 2013, during the troubled roll out of the ACA. The latest figures, recorded in a July 5-9 Gallup poll, come as the percentage of national adults without health insurance rose in the second quarter of 2017. Meanwhile, Americans are conflicted on the best approach to healthcare reform -- as are the members of Congress. Mentions of healthcare as a national problem have heightened when the government has tackled the issue in the past. 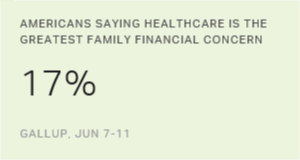 Most notably, one in four Americans mentioned it in August and September of 2009, as angry constituents voiced their displeasure with the ACA in town hall meetings. 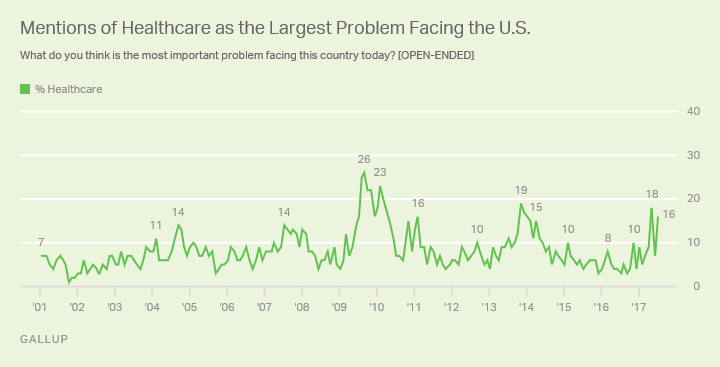 Mentions of healthcare as the nation's top problem were also high in 1993 and 1994 as the Clinton administration attempted -- unsuccessfully -- to tackle healthcare reform. Democrats (22%) are more than twice as likely to name healthcare as the biggest problem as Republicans (8%), while 17% of independents say healthcare as the greatest challenge the country faces. Since President Donald Trump was elected in November, Democrats have been most likely to list the issue as a major problem. All party groups are more likely now than in June to say healthcare is the most important problem, but the increases are larger among Democrats (nine percentage points) and independents (11 points) than among Republicans (five points). Healthcare has been among the most frequently cited problems since Trump was elected, as the issue was one he pledged to address by taking up major legislation. But dissatisfaction with government and leadership remains the most-named problem, with 19% of Americans mentioning it. This issue garnered 25% of mentions last month, marking the highest figure for this problem since November 2013. The issue dropped in salience this month with a greater news focus on healthcare in recent weeks. At this point though, healthcare reform and the way government operates may be two sides of the same coin in many Americans' minds. The economy (8%), immigration (7%), unifying the country (7%) and unemployment (6%) are also among the most-cited problems facing the U.S.
Americans' mentions of the situation with North Korea showed up again on the most important problem list this month, albeit at a modest 4% of all mentions. The situation with North Korea also garnered 4% of mentions in April 2013, as the country made continued missile threats against the U.S. Outside of now and April 2013, Americans have rarely mentioned North Korea as the top problem in the U.S.
Top Issues Americans Named as Most Important Problem Facing the U.S.
About One in Four Satisfied With Direction of the U.S.
Twenty-seven percent of Americans are satisfied with the way things are currently going in the U.S., similar to last month's 24%. 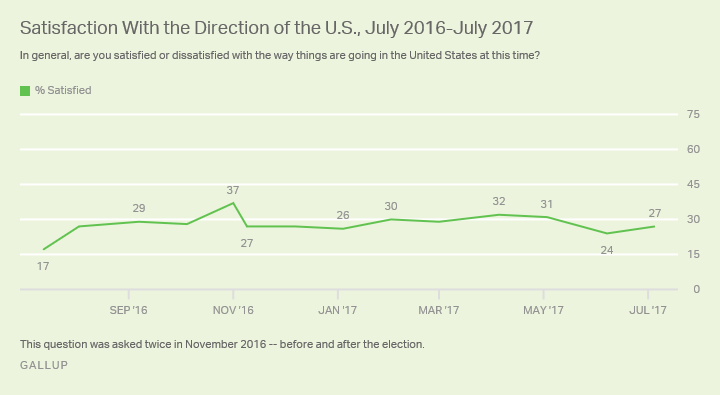 There have been a few ratings above 30% in recent months, including 32% in April and 37% immediately before last fall's election. Republicans (48%) remain more satisfied than independents (25%) and Democrats (11%), reflecting the pattern whereby supporters of the president's party tend to be most positive about national conditions. Mentions of healthcare as the top problem in the U.S. are up as Republicans in Congress continue to struggle to devise a plan that can gain enough support to pass. Many Americans may also be concerned about the impact new healthcare legislation could have on themselves or the country. For example, the Congressional Budget Office has estimated that 22 million currently insured Americans would lose coverage under the Senate bill. The outcome of Affordable Care Act repeal efforts might continue to keep healthcare among Americans' top-issue concerns, as well as the government itself. While many who name the government as the most important problem specifically mention Donald Trump, many also cite partisan gridlock and the inability of the federal government to address the major issues facing the country.